The Battle of Jutland was a naval battle fought between the Royal Navy and the German High Seas Fleet on 31 May and 1 June 1916 in the North Sea near Jutland in Denmark. It was the largest naval battle of the the war. The German plan was to use their fast scouting group of battlecruisers to draw Vice-Admiral Beatty’s battlecruiser squadron onto the main German fleet and there, destroy them. The two opposing forces met on the afternoon of 31st May 1916. A running battle ensued, during which the Royal Navy lost two battlecruisers, until the main German fleet was seen. At this point Beatty’s battlecruiser squadron turned back and brought the pursuing German ships towards the main British fleet of Admiral Jellicoe. That night these two main fleets of 250 ships engaged each other twice before the Germans, recognising that they were outnumbered, broke off the engagement and returned to port. Both sides claimed victory. The British lost more ships (14) and three time as many sailors (6,000), but the Germans never brought out their main fleet again, preferring to concentrate on submarine warfare. Over 500 of those who were killed were men from London. HMS Indefatigable was a battlecruiser of the 2nd Battlecruiser squadron and part of Vice-Admiral Beatty’s force at the Battle of Jutland. 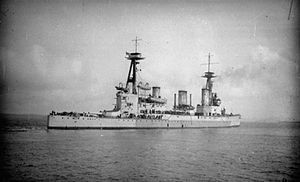 HMS Indefatigable was the first British ship sunk in this engagement during the opening phase when the British battlecruiser fleet engaged the German battlecruiser fleet during the “Run to the South”. Hit at 4 pm she started sinking and further hits a few minutes later caused a massive explosion and she sank. Of her crew of 1019 men only two survived.